Johns Cross Tack Room are proud to provide a fantastic choice of equestrian supplies from a wide range of well known brands, including Dodson and Horrell. Our selection of products from Dodson and Horrell are all available for you to purchase at fantastic prices today. Make sure to browse through similar items that we have on offer from Dengie today too. This trusted brand has built up its name in the equestrian world since its small beginnings back in 1939. From these early days it has gained a reputation for producing high quality feed with fantastic nutritional values, and still maintains them to this date. The family run business is true to its early days and runs from Northamptonshire where it was founded. Making sure that your horse is well fed with the right kind of food is highly important and exactly what this brand allows you to do. Choose from a number of different cube types including those for competitions to ensure a slow but lasting releasing of energy. You will find a sixteen plus mix from Dodson and Horrell which has the perfect blend for older horses, so they will benefit from the high fibre, high calorie mix that is easy for them to chew. As well as horse feed there is a selection of poultry and small animal food too such as ewe and lamb nuts and weaner pellets. Both of these provide a high level of protein made from top quality ingredients. 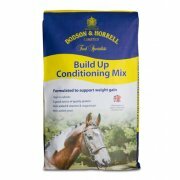 Having viewed our selection of horse feed and more from Dodson and Horrell, why not see what products we have for you? There is a fantastic choice of jodhpurs and breeches that are perfect for everyday riding, plus find smart competition and hunting wear too.